Scrap all the stuff you’ve been planning for your next Q1 campaigns - and maybe even your Q4s because things are about to change. It’s a “hold the front door” moment in marketing and it has me reeling slightly. Well, where do I start? On the 25th July 2017, HubSpot gave partners a sneak peek live webinar on its new Content Strategy tool, currently in beta. 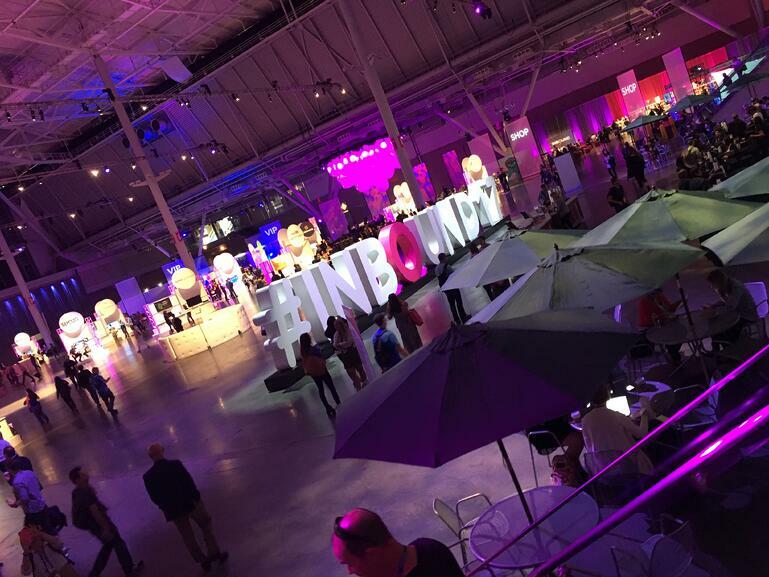 Partners get a look before the products go live to the general public, and in this case, HubSpot released five new tools, announcing them at Inbound, which means we can now tell you about them. Check out our previous blogs on Campaigns and Reporting and Success and Conversations. Things are changing. Inbound marketing hasn’t changed much in ten years. Really! You created a campaign around a CTA and a Landing Page. You blogged about a topic and kept the good stuff for the end, y’know, where the potential customer had to sign up. Now HubSpot has come up with Content Strategy, which encourages you to take those content downloads and white papers out of the PDFs and onto your main website pages because Google now rewards sites whose content is organised by topics instead of simply keywords. Keywords are out; topics are in. Why are keywords out and topics in exactly? So, HubSpot realises that with voice search and with the way we use Google changing, keywords aren’t so relevant. HubSpot’s rep gave this example. When Google first came out and you were searching for a restaurant, you might have searched for “Restaurants Boston” as your key terms, but now you might use Siri or voice search and say, “where’s the best place to eat near me?” We now search the way we talk. Search is conversational. The way search used to work is no longer valid. There are quite literally thousands of variations on the same search. For example, there are 1,005 variations for the concept of “follow-up emails after a meeting.” Are you going to write 1,005 blog posts to capture traffic? You’d have to write lots and lots of very specific content for that to work. HubSpot then advised marketers to write around long-tail keywords. Make your keywords answer specific questions. More pointedly, good marketers do their keyword research that would rank by search volume and write blog posts on those keywords that get 10-50 searches per month, ensuring a 1-6 top spot on the Google SERP. Then someone would theoretically click on that content, which would lead to a CTA, which would lead to a landing page with a form on it, offering something. That way has worked for the last decade. 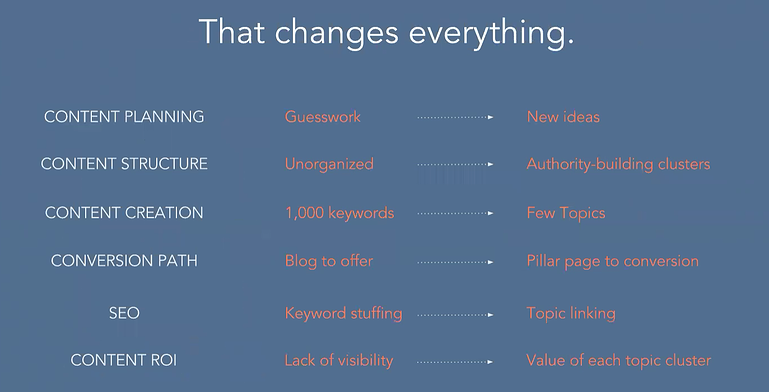 Check out the picture below on how keywords worked before the new changes. As you can see, the likelihood of ranking in Google for Fat Head keywords was virtually impossible, but as you approached longer tail keywords, your chances became almost guaranteed. Uh, so what do I do now? What marketers are supposed to do now is use those Fat Head keywords as Pillar Topics. Think of a wheel spoke. The Pillar Topic is the middle bit, and then you’ll write content around that spoke, filling the outside edges. The new HubSpot tool will give you a direct way to show Google that all of that information is linked and relevant. You’re making yourself a super-expert on that one (or six) Pillar Topic. The new content tool means you can now create clusters of pages and content around core topics, which means you’ll rank better in Google. So, we are now realising that opportunity lies again in the two to four keyword searches. (Gasp! Scary times! I know). Your new marketing strategies should be moving away from long-tail keywords to topics. Topics is where it’s going! I know it seems counterintuitive, but it’s getting results. 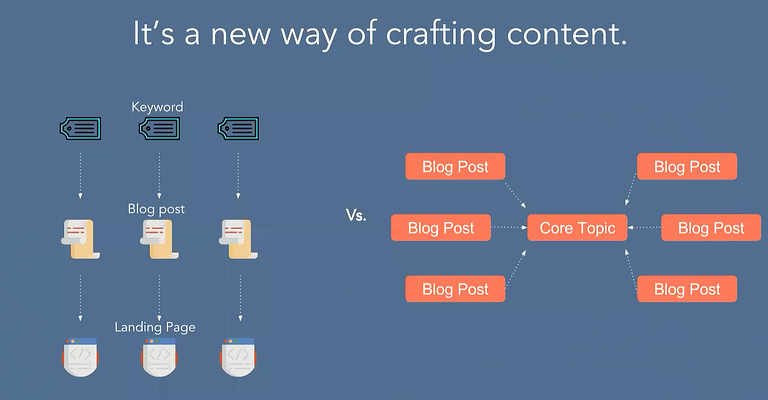 When you write content to cover one topic, you’re now going to cover something comprehensively; you’ll create an authoritative source on that one topic, which HubSpot is naming the Pillar Page, and then subsequent blog posts will be subtopic support. You’ll create one long-form content piece - as before like a content download but placed not behind an LP - and then you’ll propagate content on your social and YouTube channels, for example, driving traffic to that Pillar Page. This new structure is focused around one core topic (that Pillar Page), and then you will have posts that answer those specific questions that hyperlink to that core topic. That way, everything is interconnected, and it’s a way to build authority and show the search engine that all of these ideas link together. They’re all friends and your website is super-relevant on this specific topic. HubSpot have tested this new method with a few of their client accounts. One company, etuma, received four times the leads, compared with their old approach. Townsend Security, who had been a client since 2015, made it to the first page of Google for their core topic for the first time. This company had been doing well until a competitor entered in the second quarter of that year depleting 55% of their organic search traffic. Ouch! Now their traffic is 20% higher than they were in that previous good quarter. IDS Agency in Santiago, Chile said that this new methodology and tool transformed their content marketing and the new framework has streamlined the process, helping their clients get more traffic with less content. This new framework allows companies to have more visibility, create more answers, grow organic traffic, and generate new revenue streams, which means you will attract and own the awareness stage for any topic. Driving more leads through the funnel from that early stage will increase revenue. So many businesses focus on higher-order niche content (i.e. the stuff only the people who are ready to buy will read), and, for our clients, we have continued to do something right: we create lots of awareness stage content because we know that it brings in leads because, most of the time, buyers are in the researching stage and they want to put feelers out before they commit to buying at first. So - with this past structure - you had to create lots of content around those early - and perhaps unrelated - questions. Sure, delight is also an important stage of the funnel too, but you have to attract those customers first. How’s my content planning going to look? Before you may have come up with so many blog post topics a week, and they may have focused around a central theme, but the posts may have been unrelated, or, conversely, they may have been too related (i.e. trying to cover every keyword variation imaginable). Now, your planning job just got a whole lot easier. You won’t have to guess what your persona will search that month, you’re going to focus on your expertise topic, and you’ll then create authority-building clusters on a limited number of topics; you’re not going for ‘jack of all trades, master of none’ here. Now you’ll cover a few topics really, really well. Your Pillar Pages will be designed to convert leads, and they may visit linked topic pages, which creates ROI; your content keeps giving back. This new tool will allow you to enter the pillar topic, and then suggested topics and subtopics will appear for you to use, or you may create your own. You can use your in-house or agency design teams to bring content to life - just as you would with a previous infographic, white paper, or content download, or you can use a template that’s available on the marketplace to build Pillar Pages, and help outline what you need to put in a Pillar Page. The old way of SEO meant trying to stuff as many keywords into the optimisation tab, attempting to rank for as many keywords as possible. Of course, that’s not how Digital 22 has done, but we’ve seen it done. Today, that doesn’t work so well. We need human traffic (not electronic traffic) to be engaged with the page and the content on the page. There will be a HubSpot tool that will report on topic clusters, letting you know how many new contacts were gained per topic cluster, and the number of customers each cluster is generating as well. HubSpot is calling this an Information Architecture, which means you’ll have content coming together to form one big picture. Now when you go to the Content tab in HubSpot, under File Manager and Design Manager, you’ll see a “Strategy” tab. Where you can create a series of topic clusters, and link blog posts on that content to each one. Here’s a sample I created on our Digital 22’s beta page. When everything is properly up and running, you’d theoretically see those links that lead from the Pillar Page (in this case, the made up one “Lead Generation”) to the subtopic (for example, “B2B Lead Generation). If we had a Pillar Page, and that blog post had a link to that Pillar Page, it’d all be up and running. Here, it shows that we have 37 DA on this topic; it’s searched for about 590 times per month; what we have written has 81% relevance to that topic; and the similarity to the core topic is 100%, which is what you want. This tool isn’t up and running yet, but that’s an example of how it would work. Since it needs expansion in time, you can only create eight pillars, but you can create as many subtopics as you like (by pressing that plus button). HubSpot will also come up with suggested subtopics and suggested blog posts from your site that you can link those subtopics too. It’s easy to use and intuitive. In their webinar, HubSpot noted that if they talked about “Inbound Marketing,” their relevancy score would be high, but if they tried writing about “taxes,” that score would tank. The topic at the center will be a 2-4 word term as a collection (the umbrella) for all of the different subtopics. 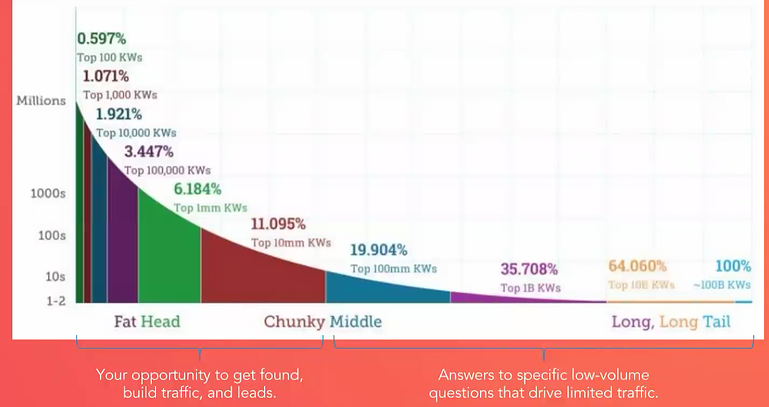 This image is from HubSpot’s webinar, and shows how the page will work eventually with views, contacts, the number of customers viewed, backlinks, and so forth. This page shows how you add a core topic. You don’t have to run around in an emergency because you can simply turn some of your content downloads, that aren’t hidden behind a form. Pillar topics are best suited for long-form content. Um, how will I get leads if they don’t have to fill out the Landing Page form? HubSpot has found out that people are actually more inclined to give their details if they find the content valuable. You’ll now build CTAs into the page with an offer for the potential lead to download the document and keep a PDF copy. Many people will click on that form and fill out the traditional landing page as usual. Plus, the Pillar Page is optimised for people reading it and for the SERP, which means your relevancy for the topic may just land you on page one. The relevancy score is low. Should I write about this topic? Sure! The relevancy score just shows what you currently have on site related to that topic. If your relevancy score is low, that just means your current domain doesn’t have any information on that topic yet. If you want to be known as an authority on that topic, then develop the content and the metrics will rise. Where should I put my Pillar pages? Pillar pages should always be on the top level of your domain, so that means you may want to create a page from your homepage that links to a specific topic. Your content shouldn’t be hiding behind a form anymore. Sure, it worked for others, but how will I tell if this new method is working for me? 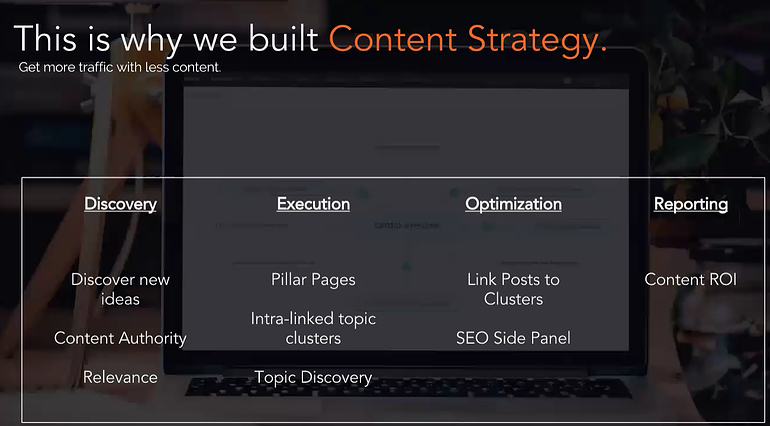 The content strategy tool is integrated with HubSpot’s reporting tools, so you can measure each topic cluster’s traffic-gaining influence, contacts, and customers just as you would any other tool. Then you can keep working on the content that’s driving traffic, and move away from the stuff that isn’t. Will content strategy be a paid component? Content strategy will be included in the Enterprise and Basic Professional subscriptions as part of the package. What do we at Digital 22 think about this new content strategy approach? This approach is certainly new, and a little scary, perhaps, but we aren’t strangers to trial and error. As a company, we discovered what worked for us and what didn’t and have used those tried and tested methods to drive our client’s lead generation. It’s a new way of doing things, but that doesn’t mean it shouldn’t be done and doesn’t work. So many people are slow to adopt inbound marketing and it works, so it’s always difficult to be the first at the party. It’s much easier to jump on the figurative bandwagon ten years from now. We don’t have current plans to axe all of our current campaigns and alarm our clients (also because it’s still in beta and we can’t set it up for them immediately), but we will adopt whatever works in future. We continue to adapt, research the market, and see what’s new and upcoming in the world of inbound. If you don’t keep moving forward, you’ll be left behind. Let us know in the comments what you think of these new changes, and how you or your agency plan to adapt to HubSpot’s new content strategy. Here’s our comparison guide for HubSpot vs Drupal vs Wordpress. See which one will work best for your marketing.